The demonstration was immediately kettled by the riot police and was under constant CCTV and police surveillance. The police then preceded to order demonstrators to remove face-covering clothing with the excuse that “that was the agreement”. Let one thing be clear, there was no agreement about this. It was obvious that the police was searching for an excuse to make a mass-arrest, and so it was. 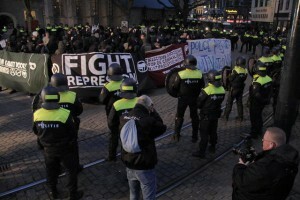 The police kettled the demonstration and attacked its participants. While the police beat up people on the square they called through megaphones that people should remain calm; a typical de-escalation tactic by the The Hague Police. People were punched in the face, an arm was dislocated and certain people left in need of medical attention. Headlocks were also used during the arrests and the few people who left the demonstration when the police ordered them also received some punches outside the kettle. In the end 166 people were arrested. The demonstration was faced with the exact situation it condemned: systematically banning and limiting demonstrations, criminalising, attacking and arresting of anarchists and antifascists.